Shri Gajanan appeared in Shegaon town. In Magh on 7th of the waining moon. Eyes focoused on his nose. He had the radiance of morning glow. 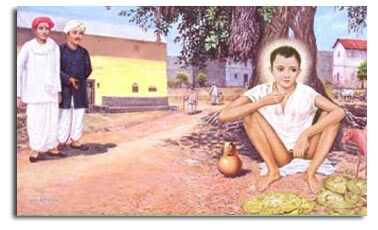 On 23rd February 1878 (7th day of Marathi Month- Magh, Shake 1800) Shri Gajanan Maharaj First appeard in Shegaon. This day is marked and celebrated as 'Shri Pragat Din Utsav'. On this auspicious occasion various religious rituals are performed in Shree's Mandir, such as - From Magh Vadya Pratipada to Saptami - Maha Rudra Swahakar, on Pragat Din - Yaag Purnahuti and Awabhrut Snan at 10 am, Kirtan for Shree Pragat Din Utsav from 10.00 am to 12.00 noon and thus at 12.00 noon Shree Pragat Din Utsav is celebrated.